A simple step will generate enormous, lasting impact in your consulting firm. It’s easy. You’ve thought about it. Now’s the time to act on it. Last week I upgraded my office with some new storage systems. They’re sleek, roomy, organized—just what I needed. But you know what the coolest part is? You just tap on the cabinet doors and they spring open. There’s a doodad—a push-latch—affixed to the cabinet that cracks the door open quickly, granting faster, easier access to the goodies inside. What’s the push-latch for your consulting firm? What’s the simple mechanism that will jolt you forward and accelerate every task? More broadly: templates, routines, frameworks and written processes. Starting routine tasks from scratch every time decelerates your pace and, importantly, reduces your value to clients. Standardizing your tasks and springboarding off of templates, on the other hand, increases your efficiency and value. Every template and written process you create for your firm is a push-latch. Plus, by constantly improving your templates with each, newly-discovered best practice, you compound their power. For example, below are just five of the templates my team and I use to boost our speed and the quality of our work. Some variation on these templates could help your firm too. Perfect Proposal Template: You can download this template by clicking this link. I use the same template to guide me as I create each new proposal. “Finding the Right Consultant” Worksheet – I use this when helping my corporate clients. It accelerates the process and delivers outstanding results. Client Call Templates: Many of my calls with clients follow a familiar pattern. Therefore, I’ve created templates for the most common calls to keep them on track and enhance the value. Recap Template: Every consultant and firm I coach receives a recap of their commitments and their key learnings within moments of each conversation with me. A template makes that possible. Project Update Template – My larger clients receive an update every two weeks, like clockwork. That would be a royal pain if it weren’t for an easy template (and a great assistant). Create new push-latches for your firm, one at a time, over a few months. Every other Monday morning, choose one new template you want to create and adopt. Just one. If you have other ideas, put them on a list to draw from at a later date. Develop the template over the course of the week. It doesn’t have to be perfect, it does have to be functional. File the template in an easy-to-access library. Implement the template the following week (or whenever necessary). Over the next six months you’ll implement 13 new templates and processes. Your labor intensity will decline while your quality improves. Click here to download the Perfect Proposal Template. Read my Guide to Winning Clients and follow the link in the book to 15 online, companion resources. Right now, receive $65 of frameworks for free when you buy my book and enter your receipt at http://WinClientsNow.com/bonuses. What other templates would push your consulting firm into high gear? Please share your ideas below. David, this aligns with my goals for this year in building scalability and consistency among the subcontracting consultants who work with me. I’m using one of my new, highly motivated and knowledgeable consultants (who worked as an internal consultant for a national organization) to build many of those used frequently, but they’re on the client side to guide them in their work. I also developed a communication form for the consultants to consistently communicate with me, and then they place it in Dropbox under the client name so I can go in at any point and review their pace and identify any barriers to progress. I did start building the context form for potential clients also. Thanks for confirming that I’m on the right track. 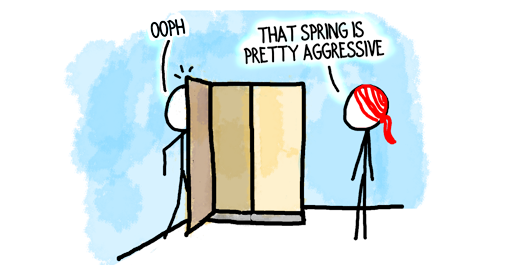 I appreciate your perspective (and stick figures). Susan, you are 100% on the right track. For solo consultants, templates are a route to reducing labor intensity. For boutiques like you, who are trying to scale, they add the benefit of forcing you to make your processes cohesive, repeatable and transferable, which opens the door to others taking on the work. Your communication form sounds like a terrific innovation, and one that any boutique that makes heavy use of subcontractors could utilize. Very very true! I have a couple and need to work on more. Terrific, Ian. What templates do you still need to put in place? Thanks for noting the typo. A few readers contacted me and we’ve corrected it. A few missing letters here and there… you’d think no one woud notic. This is fantastic. In my previous firm, we created meeting checklists and templates. for example we created a detailed project kick-off checklist that ensured a smoother start to projects. This also made us more competent in the eyes of our clients, when they saw how orderly and detailed our kick-offs were. Note: on the graph above, why does ‘value to client’ appear to decrease with increase of standardization beyond a certain point? Tom, it sounds like your previous firm set you up with good kickoff habits. Did they also have checklists for the end of projects? How you wrap up an engagement sets you up for future work. Great question about standardization. Value tails off once our solutions start to wander into one-size-fits-all territory. Your kick-off checklist may provide a good illustration: A wholly new email at the beginning of an engagement may be rambling, not optimally structured and omit important details. A template/checklist allows you to send a well-structured, effective email with exactly the right information. A form letter sent to the client may be perceived as impersonal, may include irrelevant information not appropriate to this particular project while omitting other, critical pieces. 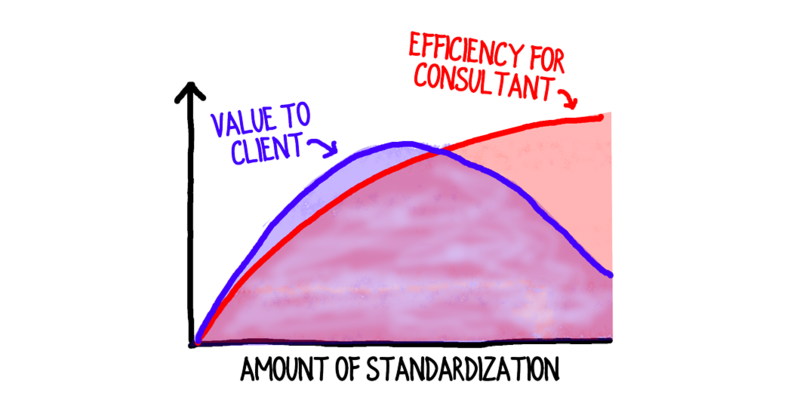 The most value for the client occurs when there’s enough standardization to capture best practices, but not so much as to ignore current circumstances. Maybe that’s a blog post in itself. The trick is to remember to use them! I have been doing this for the past couple of years and find that storing checklists, some templates, etc. in OneNote makes them more accessible and easier to edit on-the-fly as I improve my practices. It does sort of defeat the purpose when you develop a template then forget to use it! OneNote is a very effective solution. (One of the firms I work with runs everything out of OneNote.) Google drive or some other cloud-based drive can also be good. We use a combination of Google drive and an in-house “cloud” system.